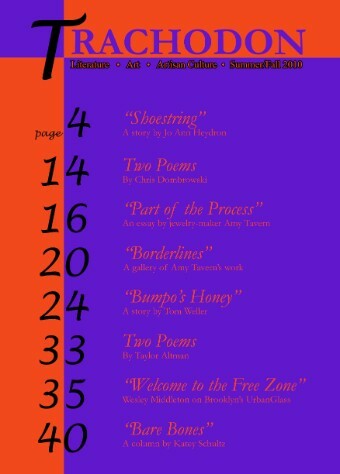 Issue 1 now available online! Click the cover image above to read it. Our first issue features two short stories, two poets, and two nonfiction articles exploring artisan culture: a story on Brooklyn's UrbanGlass, and a jewelry-maker's exploration of her creative process and a gallery of images. It's available as an ebook and paperback (while supplies last). Taylor Altman was born and raised on Long Island. A graduate of Stanford University and the Creative Writing Program at Boston University, she currently lives in the San Francisco Bay Area, where she works for QuestBridge, a non-profit that connects low-income students with scholarship opportunities. Her first book, Swimming Back, was published by sunnyoutside press, and her work has appeared in The Alembic, Salamander, Silk Road, and Triplopia. Born and raised in Michigan, Chris Dombrowski has lived in Montana for long enough (over a decade) to call himself a Michi-tanan. He has worked as a river-guide, freelance writer, cabin painter, poet-in-the-schools, and instructor of creative writing. He is the author of By Cold Water, a collection of poems, and Fragments With Dusk in Them, a chapbook. His poems have appeared in such journals as Colorado Review, Crazyhorse, Denver Quarterly, Ninth Letter, Orion, Poetry, and have been anthologized in Joyful Noise and Making Poems. He lives with his family in Missoula, MT. Jo Ann Heydron’s fiction, nonfiction, and poetry have appeared in Puerto del Sol, So to Speak, Sojourners, Prairie Schooner and other publications, as well as online. While raising three children, she taught English at community colleges in California. In 2007 she moved with her husband to Bellingham, Washington, where she writes full time, is getting reacquainted with her siblings after long geographical separation, and participates in local organizing for post-peak-oil community life. In 2009 she received an MFA in fiction from Pacific University, in Forest Grove, Oregon. Wesley Middleton is a writer and non-profit arts manager living in New York City. Her plays for young audiences have been produced around the US. Having worked as a teaching artist and arts administrator in Seattle and as grants manager for Penland School of Crafts (NC), she now writes essays, articles, and instructional DVDs, and works as Producing Director for Ripe Time, a critically acclaimed theatre company in Brooklyn. wesleymiddleton.blogspot.com. Originally from Upstate NY, Amy Tavern is a studio jeweler and current Resident Artist at the Penland School of Crafts in Penland, NC. Amy received her BFA in Metal Design from the University of Washington in 2002. In 2009 her work was included in exhibitions at Sienna Gallery and Quirk Gallery and she was named an American Craft Council Searchlight Artist. In addition to being a full time maker, Amy also teaches and lectures. Amy is an active blogger, posting several times a week about her work and the work of other jewelers at www.amytavern.blogspot.com. Tom Weller teaches at Indiana State University, where he is the Student Support Services writing specialist. His fiction and creative nonfiction have appeared recently in Plain Spoke, Silk Road, and Grassland Review. He spends his free time rehabbing his jump shot.